It's been a while since I've had the luxury of daily check-ins with TFL. Lots going on this summer, and actually I really don't have the time even now! 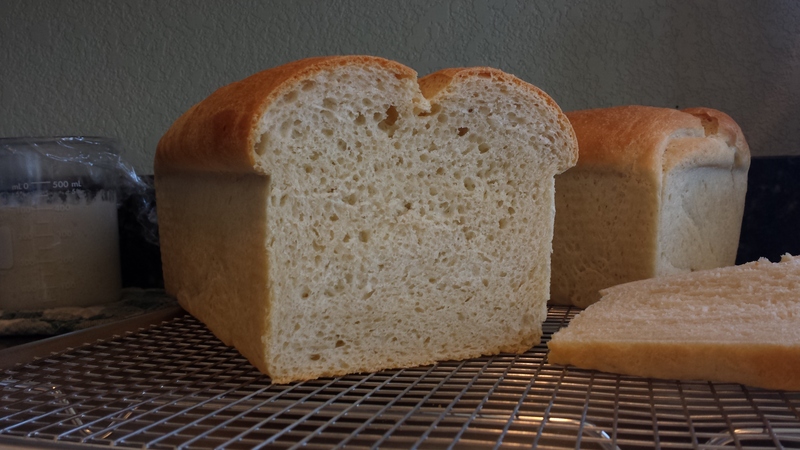 But I made some sourdough sandwich bread today for the first time (so far I have only made rustic loaves with my starter), and I wanted to get the recipe written down and share it with anyone else who might like it. Combine 1 C starter (at feeding time, I feed mine every 12 hours at a 1:4:4 ratio) with 4 C KAF bread flour and 2 C Brita-filtered water at room temp (or it might have even been straight from the fridge). Stir, cover with plastic wrap and leave out overnight. Pour sponge mixture into mixer bowl and add 1/4 C melted butter, 2 TBSP sugar, 2 tsp kosher salt, and 1 C flour. Mix until combined, then add remaining cup of flour until dough is fairly stiff (my usual yeast-raised dough uses about 6 C flour and 2 C water, plus 1/4 C melted butter, for around a 35% hydration level). The dough will clear both the sides and bottom of the bowl. Knead at speed 2 for about 4 minutes or until dough passes the windowpane test. Transfer to oiled bowl and let rise in warm place until doubled, around 2 hours. Shape into loaves and place into greased pans. Let rise for about an hour, or until light and risen nicely, then bake at 375. This bread is tangy but not terribly sour. It tastes a little like Panera's sodo, actually, but is less chewy and has a very thin and soft crust. Moist, tender and fine crumb. Can't wait to try it in a ham sandwich! Katie, you're back! I've missed you and your always interesting comments. The sandwich loaf looks lovely and of course I will have to copy down your instructions and give it a try. Did you add any whole wheat flour? My daughter-in-law only buys ww bread and if I sneak in a cup of white ww flour I can tell her it is healthy when I make the grandgirls a sandwich. Have to tell you about my near disaster today. I don't know whether you saw the lovely loaf Will Wraith made and showed on the site? I decided if a 10 year old could do it so could I, and today was the day. I managed the french fold quite nicely and realized the dough was rather wet - but I didn't have the sense to add enough flour to correct it. Just added some to the counter to stop it sticking. Plus the day turned out hotter than I expected and suddenly I had some very abundant dough. I did 2 sretch and folds and shaped it with TT's parchment and towels couche and put the whole deal into the frig for a couple of hours. Didn't slow it down at all so I figured it was going to be a big mess anyway so I slashed it really deeply and baked it on the hot stone. For some reason it didn't deflate, but it was a huge wide loaf. I also accidently sprayed the oven with oil (! ), not one of my better moments. Anyway, the bread has a nice yellow crumb, very tender, and I cut it into pieces to share with the other geezers here in the park. They don't care that it was nothing at all like Will's loaf! A.
Hi Annie and Dolly, and thanks for the comments! 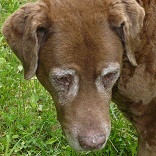 Annie, I'm glad your bread still turned out tasty! And Dolly, thanks for trying my recipe! I can't wait to make it again. It's, as I like to say, "delish". Oh, can't wait to see your pics, Annie! I'm so glad it came out well for you! It is a great-looking loaf, Katie. Your description sounds like it's just what a sandwich bread ought to be, and I'm another one planning to try it sometime. Also looking forward to Annie pictures--I hope she sneaks in one of the cats..! Hi Katie! This looks beautiful as usual! I will try making this during the coming week. I made your sourdough English muffins again yesterday and they turned out spectacularly!!! Not because I'm an awesome baker but because your recipe rocks! I'll let you know how the sandwich bread turns out this week. Stinky seems to be gaining "power" lol! Just wanted to say thanks. I was very pleased with the crumb and crust on this bread. My family ate it up as well. I did have some issues with reaching dough consistency as described as I bake everything by weight and needed to convert. But overall, a painless experience for a very nice result! First let me say that I am new to TFL, so happy I stumbled onto this site. I tried this recipe with my San Francisco starter and let me tell you.............delicious!!!!! Wouldn't change a thing. Thanks so much for posting. I just made this for the first time. Actually, this is the first time I've made any sourdough bread and the first time I've made a sandwich loaf of any kind. * My 100% hydration starter, at feeding time and after being well stirred down, is 268g per cup. Do those numbers look right? The sponge (really looks like a large batch of 100% hydration starter) more than tripled overnight in a 77 degree oven. When mixing the last portion (expected 120g) of flour, I had to add an extra 318g to get it to pull away from the mixing bowl and not be a wet, sticky mess. Maybe the original recipe's "cups" are some really well-packed bread flour? First rise was 90 minutes - it doubled. I turned it out onto a floured board, cut it in half, gently shaped into rectangles (small dimension the length of my bread pans), folded into thirds, and plopped them into buttered pans. Second rise took 100 minutes - 1" over top of pans. Both rises in 86 degree oven with a pie plate of hot water. Brushed with melted butter and cut a 1/2" deep slash lengthwise. Baked in 375 oven for 35 minutes, rotating half way through. ** I presumed that the recipe was intended for 9x5 pans. My pans are larger (KAF 10x5 #2944). I compared the volume of my pans to a 9x5 and found that my pans hold 122% of a 9x5. I increased all of the above weights by 22%. The top isn't all that pretty, but it sure tastes good. I'm happy with it as a first attempt. Forgot to mention... I made no altitude adjustments. I'm at 6600' about 30 miles south of Denver, CO. This worked great for me--thanks for the weights, Don! I made this the day before yesterday and I too had to add a lot of extra flour. I was sort of lax on the record-keeping so I *think* I started off with about 140g per cup of flour--when I had gotten to 6 "cups" (140g each), the dough was extremely sticky still. I kept adding bit by bit and by my calculations (I wrote it down and added it up later), I added an additional 197g of bread flour (for a total of 1037g or so not counting my 100% hydration starter) before I could really knead the dough using the hook and it (somewhat) cleared the sides of the mixing bowl. Shaping after initial rise was still a bit messy, but I am out of practice on sourdough baking and I seem to vaguely recall that I used to do a resting period before shaping (maybe 30 mins?) so maybe I'll try that next time. My loaves came out really really well anyway, however, using your weights for most of the other ingredients. 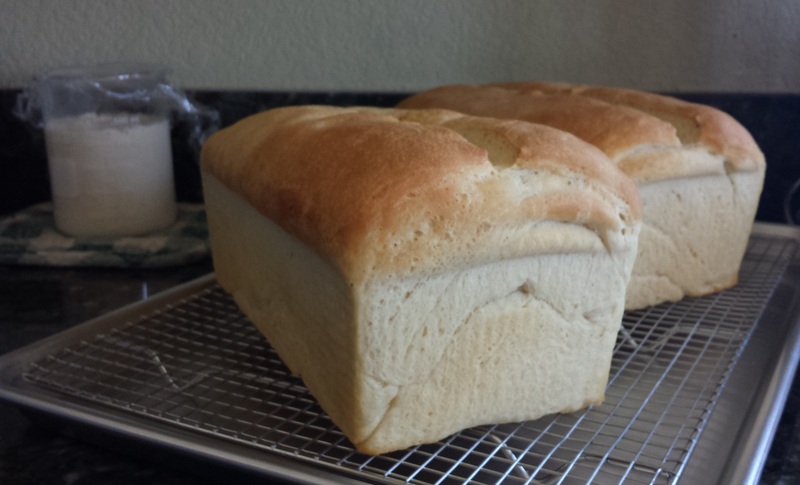 I made an 8.5x4.5" loaf with half of the dough (my pan is marked 1.5qt) and it rose up out of the pan by about an inch and looks like real sandwich bread--this pan is glass and the bottom and sides did not brown as well as the top, so I removed the loaf from the pan after about 30 minutes in a convection oven and baked the loaf straight on the rack for another 10 mins or so. With the rest of the dough, I used four 2-cup terra cotta mini loaf pans that browned the bread in a lovely fashion. In retrospect they were a bit short, though, so if I want mini loaves in the future, I'll probably just split this half of the dough into three of the mini pans so they are each a bit bigger. They still tasted great, though, and kids loved the little sandwiches. Hi there. Just wanted to pop in and say that this recipe is one I've come back to over and over again for a perfectly delicious sourdough loaf. I sometimes follow the recipe exactly for a superb white bread, and other times, I mix in some ww or other flours and sort of go by feel. Every time, I come out with a tasty loaf, even if it's not always exactly what I wanted. Thanks for this fantastic recipe! How much do I put in a pan? So, what size loaf pans did you use? And does anyone have any advice on how to eyeball how much dough I should put in a pan? I have a random mish mash of different sized pans I just picked up from Value Village without the dimensions on them (Im just gonna measure them myself one of these days but I haven't got around to it yet, Christmas season and all). Like should it come to about half way up the pan? 1/3rd? 2/3rds? Or will it overflow too much once it's risen?